Here’s an alternative to bronzing those baby shoes – paint one in a crackle finish and add some silk flowers! 1. Remove the shoelace from the baby shoe and wipe the outside with rubbing alcohol. Let dry – it shouldn’t take longer than a minute or two. 2. Paint the entire outside of the shoe in a color that you want to see as the “crackle” color. I used mauve, although it is difficult to see in the photo. Let dry, then apply the crackle medium and let dry until is tacky to touch. At this point, apply the top coat of paint. Now the magic begins! You will start to see the bottom color peeking through the top coat in a series of fine cracks – this is often known as an “antique” crackle finish. Let the crackle finish dry. 3. 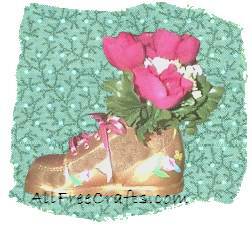 Lace up the baby shoe with a thin ribbon that coordinates with your choice of flowers. 4. Glue a small square of styrofoam or florist’s foam in the inside of the shoe, near the heel. Let the glue dry, then push the stems of your flowers into the foam block. 5. Optional – if desired, add rub-on decals to each side of the shoe.